I love photographing family portraits! I try to do these outdoors as often as possible but studio hire is also available depending on your requirements. For a selection of edited images and black and white and colour I charge £150 for 10 digitals or £250 for a full gallery, with a non refundable £50 booking fee which is deducted off the final payment. 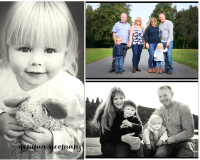 The shoot consists of a 45min family photoshoot and digital images which are supplied via digital download high resolution.